The Best: There certainly isn’t much history to work with here. You got this, you’ve got that and you’ve got the other. Well, “that” came in a model with sleeves too. Anyway, I like “the other” best. I can’t decide how I feel about the light blues they wear on Sunday. While I’m predisposed to dislike solid jerseys, they tend to look better in lighter colors than they do in darker colors. Same goes for the Royals’ use of them too. Overall the home whites in the new version look the best. The Worst: We are men of action. Neon does not become us. 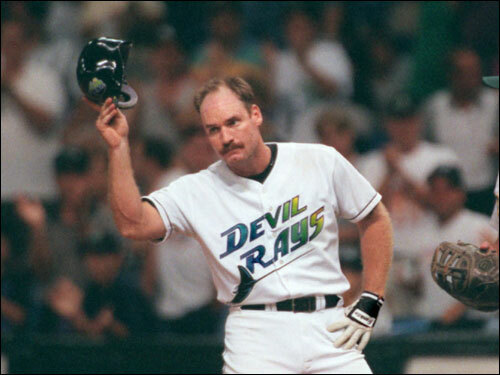 It especially does not become all-time greats like Wade Boggs and Fred McGriff who were forced to wear it late in their careers. Assessment: They could be wearing Hugo Boss and still look terrible under the Tropicana Field roof, so there’s only so much they can do. That said, I think they look pretty good now. Probably better than any of the four 90s expansion teams.